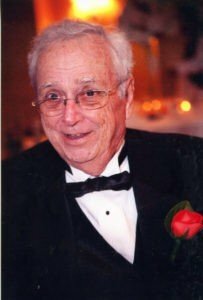 age 83, of Gainesville, FL passed away at his residence on Wednesday, January 16th 2019. Francis was born on August 31, 1935 in Pittsburgh, PA. His parents were John Martin Tracey and Ann Aloysia Tracey. After gaining his degree from North Catholic High School, he moved to Florida where he worked for Pratt-Whitney, Honeywell, and Rockwell as a computer programmer supporting the Air Force and the NASA space program in Cocoa Beach. He took great pride in supporting the nation’s Gemini, Apollo, and Skylab programs. In 1979, he moved to Gainesville, FL to work for Florida Farm Bureau before going on to obtain his real estate license and finishing his career at Florida Woodland Real Estate. As a young man Francis loved golfing, fishing, and horticulture. Later in life he enjoyed traveling the world with his wife, Beverly, attending Gator sports events, and being active in the Catholic Church. Francis is preceded in death by his parents, John and Ann Tracey; his sister, Stella Ricci; and brother Jack Tracey. He is survived by his loving wife of 53 years Beverly; his son and daughter-in-law, John and Connie Tracey of Jacksonville, FL; son and daughter-in-law Kenneth and Edita Tracey of Atlanta, GA; son Patrick Tracey of Wesley Chapel, FL; two granddaughters, Savannah and Arabella Tracey; and his sister, Mary Reed, of Pittsburgh, PA.
A viewing will be held at Forest Meadows Funeral Home 725 NW 23rd Ave., Gainesville, FL on Thursday, January 24th, from 5-7 p.m. On Friday, January 25, at 9:30 a.m., a mass will be held at Holy Faith Catholic Church, 747 NW 43rd Street, Gainesville, FL. After the mass, a graveside service will be performed at Forest Meadows Cemetery located at 4100 NW 39th Ave. Gainesville, FL. Arrangements are under the care of Forest Meadows Funeral Homes, Gainesville, FL. In lieu of flowers, the family is requesting that donations be made to the American Cancer Society.